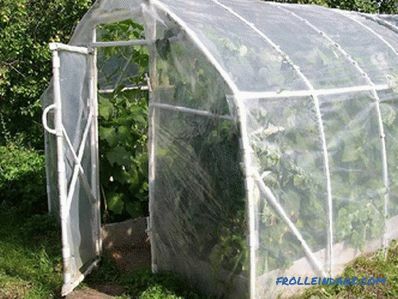 Having your own greenhouse is not only pleasant, but also beneficial, since for the present the vegetables in the supermarket are expensive, you can already have them on your table from your own plot, growing them in heat. 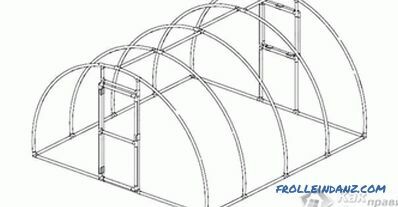 Craftsmen have come up with many ways to build a greenhouse from all sorts of materials, but now, with the advent of new technologies, hardly anyone will make such a structure from used window frames, because you can quickly, cheaply and without any troublesome make another, more reliable design. 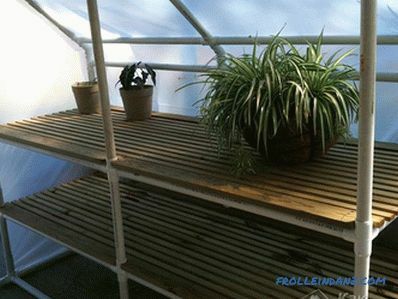 In this article we will look at how to make a greenhouse out of PVC pipes, as well as how to make a comfortable watering. Board five-meter 2 * 6 cm - 4 pcs. Four-meter board 2 * 6 cm - 2 pcs. Four-meter board 2 * 4 cm - 14 pcs. PVC pipe six-meter Ø13 mm - 19 pcs. Armature three-meter Ø10 mm - 9 pcs. 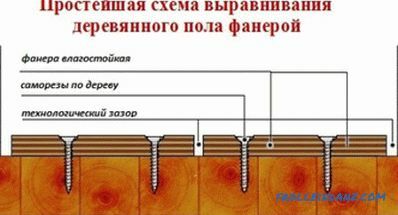 Durable film 6 * 15.3 m.
Wooden lath - 61 m.
Screws (if the construction is non-separable, then nails can be). Metal compounds (you can use those that are purchased to work with plasterboard). 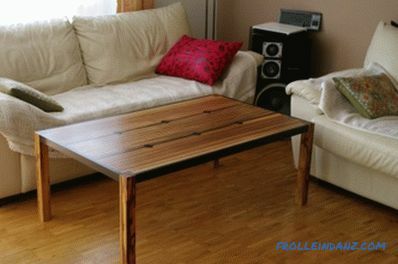 Before starting work, process all wooden parts with an antiseptic, then, on a previously prepared area, install a rectangular frame of planks, preventing it from tilting. This can be checked by pulling the thread diagonally, then fix the frame by hammering pieces of reinforcement in the corners. Make a marking along the long side so that the installed pipes are about 50 cm apart. Cut the armature in half and hammer it into 30 cm marks on the ground. In order not to constantly check how much the rod has entered the ground, make a mark on it, and hammer until it is flush with the ground. Since the reinforcement is light and flexible, it can be problematic to hammer it, especially in the packed-up soil. If this happened in your case, then use the pipe as a sleeve, placing the hammered armature into it. As a result, you should get a "chaff". 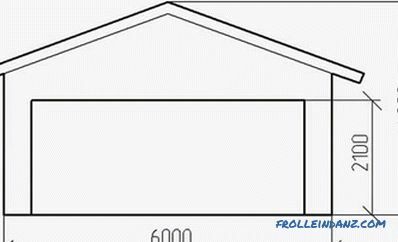 Plastic pipes should be put on each rod, the length of which depends on the size of your greenhouse, and fasten them with special brackets. Attach frame boards to the back of the greenhouse, to which the film will be attached. At the front, install the door. Now the greenhouse is ready. This design more complex, but it is stronger and more reliable than the one described above, because it turns out a strong skeleton. For work, you need a special soldering iron for soldering pipes. If it is not available, then this very common device can be temporarily taken from friends or relatives. Since such a pipe connection does not allow for disassembly, a certain sequence will be important to you. 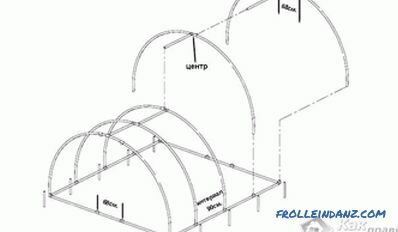 So, you have to figure out how to make a greenhouse from PVC pipes by soldering. Consider in stages the order of assembly, adhering to which it will be possible to perform the work without alterations. Measure the resulting doorway, and solder from the pipes not Foot smaller door to her in this not wedges, lightly movable structure. It remains to cover this skeleton with foil and the greenhouse is ready. 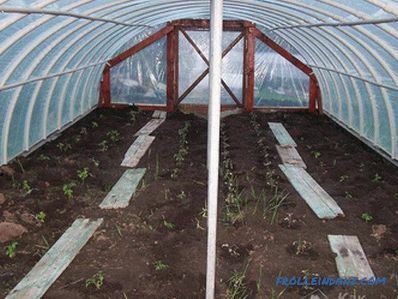 If in the winter you do not clean the greenhouse, then take care of the internal supports, so that the pipes do not break under the mass of snow. 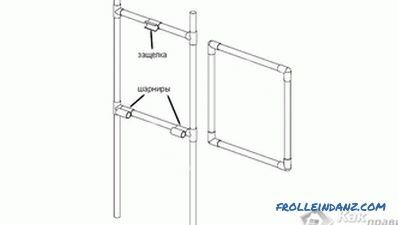 More One feature of the greenhouse, welded and PVC pipes, is the ability to use these same pipes for irrigation, and for this you need not so much. For such a modification, install a faucet in a convenient place in the frame frame through which water will flow into the pipes. After that, having determined in what places you will need watering, use a thin drill (you can also use a small nail, holding it in the drill chuck), drill a hole in the pipe. Turn on the water and see where the jet hits and whether its pressure is sufficient. The more the holes in the design are, the less pressure will be at the nozzle outlet.Therefore, do not strive from the very beginning to make the holes large, because in this case, with a weak pressure of water in the water supply system, it may not come to the top. If you don’t have a well with a pump, but a common water supply, then take into account the fact that in summer, when everyone is watering their gardens, water pressure may be insufficient. So check this irrigation system under the most extreme conditions, and only then see if you need to drill holes, making them larger in diameter. how to make a well with your own hands.